It's Sunday and do you know that in 5 weeks time it will be Boxing Day - WHAT you ask? Can't be! But it is and I have so much to do. So on to my challenge card this week for the OSAAT - anything goes for any season or event. I chose this racing car by Hope Jacare, (which can be found at Stitchy Bear Digital Stamps) as my image this week, knowing I have men's birthdays coming up and I still don't have enough cards in my collection to cope with them all. When making this card I had several challenges in mind particularly the sketch and birthday card from Truly Scrumptious. The image has been coloured using promarkers and everything edged with faded jeans and/or vintage photo. and stickles. The papers are from my box of bits and the sentiment is from Lynne at Sentiments 4 You. The little hinges are Sissix die cuts and I used the TH on the edge scallops die. A fairly simple card - but one that will be great for several birthdays coming up. Creative Belli - Something old, something new, something borrowed, something blue. Lovely male card! I love how you've found added details that aren't 'girly' - that's so hard! & stop reminding me when Crimbo is!! Adorable card Brenda....I'm so glad you found some crafting time! Don't work too hard now. Fabulous Brenda!! A great male card made perfectly!! great male card Brenda.....love the colouring....also love your blogheading....thanks for your friendly comment on my blog! Very nicely done. Great manly card and love the blue. Thanks for sharing on the Belli challenge. First class!Thanks for joining us at SCD this week. OMG! Fantastic card for the Boys. 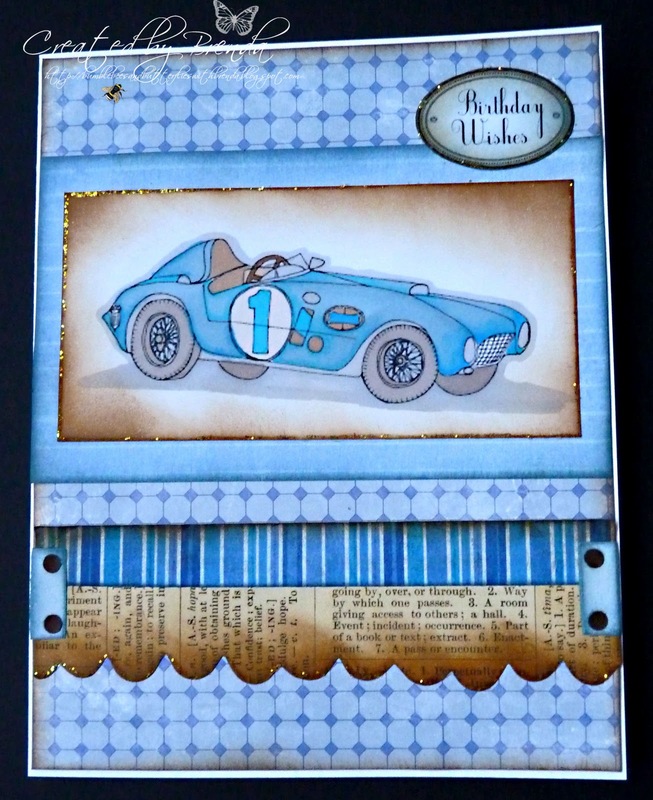 what a lovely card - the car is just fab and fits in really well with our theme for the week - thank you for joining us at SCD hope to see you again soon. 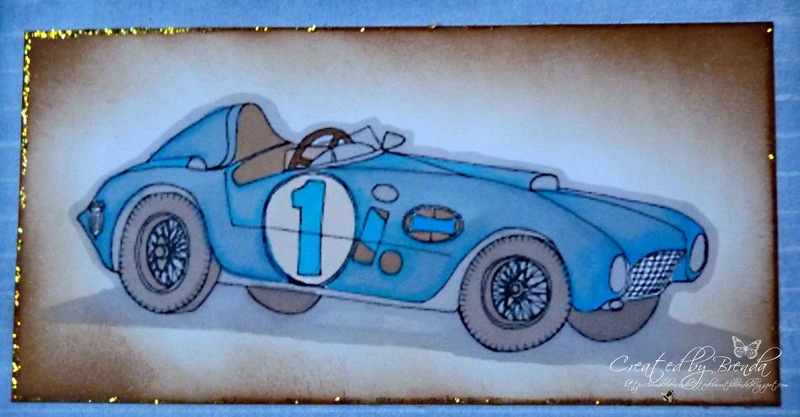 What a wonderful little race car and I love how you colored in the shadow...awesome colors and design, too!!! Thanks for playing along with us in the Belli challenge!!! such gorgeous work, thanks for playing at SAM. A fantastic birthday card Benda. Ideal for a man. I love it and really dont like making male cards . So its given me inspiration to make my grandads card that ive been putting off lol. Brenda, your male card is adorable. 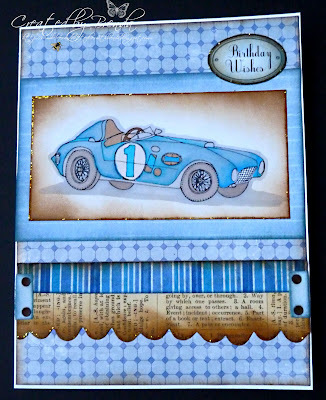 A great 'boy' card Brenda....love the newsprint paper on there. Great card and love how you have managed to incorporate the other challenges.